Delighted Momma: The Merino Baby Sleep Bag--The product that solved one of my biggest Mom fears! The Merino Baby Sleep Bag--The product that solved one of my biggest Mom fears! I think every Mom has things that worry them when it comes to their babies. One of my biggest fears during the baby stage is loose blankets in the crib. My worry is that they end up pulling the blankets over their face while they sleep and they suffocate themselves. With my first son he would do this as really young baby, while he would take naps and it would freak me out. It freaked me out so much that I decided not put any blankets, stuffed animals or "extra" things in his crib until he was almost a year old. I just dressed him like an Eskimo when he went to bed if it was cold. I was planning on doing the same thing with Ronin who is 5 months old currently. A wonderful company contacted me recently and asked me if I would like to review something called the Merino Kids Baby Sleep Bag, which is the worlds best and #1 top-selling merino sleep sack worldwide. I almost never do reviews but I quickly checked out the link and realized this is EXACTLY what I have been looking for, but I had no idea it even existed! Okay so let me tell you this is wonderful! It is made of organic cotton, which is incredibly soft and the design is pretty genius. It has two little snaps at the shoulder and you simply zip your baby up in it kind of like a body sleeping bag. It does not restrict your baby of movement and they have plenty of room to wiggle and move around. This is perfect since Ronin hates to be swaddled . It also makes diaper changing really convenient with the zipper located at the bottom, which I recently realized when I had to do a midnight diaper change. One more very cool feature that I must mention is that it has a nifty safety belt aperture built into the sleep bag making it super easy to transfer your sleeping baby between the car seat to the crib all while keeping your baby sleeping and cozy. I can not say enough good things about this product. It has completely solved my mom fear and I feel at ease during the night knowing my baby is warm and safe. I highly recommend this product to all new Moms. Have you tried the Halo SleepSacks? They're a good more budget-friendly alternative. They're the only ones our NICU recommended for G! seconding the halo sleep sacks, I love that they came with a swaddler option with newborns. Look at how cute he is!!! Oh my gawd, I wanna squish his cheeks! Glad you found something to ease the anxiety. Yowza, just checked the price and I "third" the Halo sleep sacks. We used the swaddling option when she was tiny and then moved to the regular sleep sack when she got a bit older. Any of these products are awesome for keeping babies warm at night without fear of blankets. I don't want to freak you out but those super cute bumpers are just as dangerous as loose blankets. I'm the same way. I swore that I would finally give my Phin a pillow and a blanket for his 18th birthday. I caved at two, lucky kid. We used something similar to this for a year and a half, but it wasn't this cute. Seriously such a big fear that I have too. This looks like a great little sack and perfect to keep them cozy! This post leaves me completely flabbergasted; I'm sure there's something I'm not understanding here, something lost in translation or lost in the photos, because in France we NEVER, EVER use "classic" blankets in a baby's bed... And EVERYONE has the kind of item you're describing... but they're hardly an innovation, they've been around for ages! We call this a "turbulette" or "gigoteuse", which basically means that the baby can keep wiggling while inside it. I don't have kids myself yet, but everyone who is a parent around me is equipped with this product. I'm used to reading "new" stuff on your blog, because you're such an innovator, always trying new things (like Pinterest salt dough! Hope you're feeling better about it :)) And I always learn new stuff about your culture and all... but thinking baby sleeping bags are not the norm in your country really surprises me! Haha fan, this made me laugh! In europe, everyone has their baby in a sleeping bag. I moved to the us from the uk and was very surprised to find no one really knew about them! 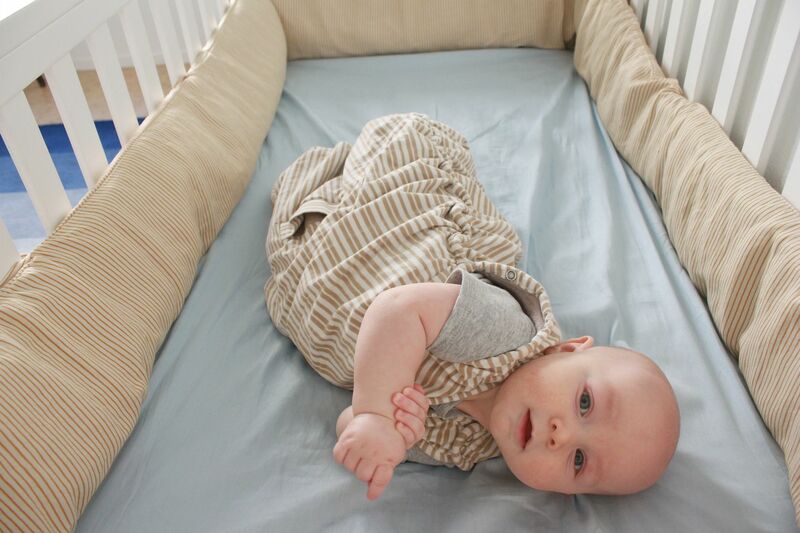 I swaddled my baby but then moved onto these merino kids sleeping bags. Now the reason these are so special and therefore so pricey is that they're made of merino wool which regulates babies' temperature, preventing them from overheating or being too cold. No need for different togs and different sleeping bags for winter and summer. That is their main USP. They are worth every penny and everyone should buy a merino kids sleeping bag for their baby. Along with my stokke stroller, this was my best buy (we used ours for two years). I'm jumping on the nothing new bandwagon here. I used a sleep sack for both my children, and they're now 24 and 22 years old. I did recieve it as a gift from Dutch friends who were astonished that we Americans did not have this as routine baby gear. Best Baby sleep sack. I love this product. I have yet to find a sleep sack I like more than Baby Deedee sleep nest. I like that they are armless, easy to snap. This also helps to keep her from overheating. During winter I put her in a footed pj and her arms stay warm enough. I love soft cotton touch and cool colors. I am yet to find my DD cold or sweaty. Highly recommended! Yes, sleep sacks were fairly popular among European parents. Relatively new concept in USA. I love the idea of a sleep sack. My DS sleeps wonderfully in his Baby DeeDee nest! I can lower the room temp by another 1 degree and he sleeps soundly. It holds up beautifully even after so many washes. Nice post. Just check the marino site and they are like $ 100. Sooo costly. Followed the thread and found www.babydeedee.com also selling most practical and awesome sleeping bags. So many positive feedbacks. Definitely going to order one in the AM. Thanks for sharing the link Rose!! seconding the baby deedee sleep sacks, I love that they came with shoulder snaps. super easy to use n care. Most practical design, highly recommended! !